Thanks! Anyone can make this loaf. Trust me on this... Anyone! I'm working on the recipe. It's not original to me and I don't want to steal Wendells thunder if he's on this forum, so I intend to contact him to let him post the link to the original recipe before I post anything other than pix and generalities. What am I doing with it? Making it more difficult . Using bread flour (not difficult) and home ground flour. The latter could pose a problem since it isn't kneaded. I just ground the wheat for the next loaf. Edit: The loaf using fresh ground whole hard white wheat is on the bowl but I can't believe it will work. It doesn't "feel" right. I'll know more tomorrow though. I'm hoping I'll be pleasantly surprised. 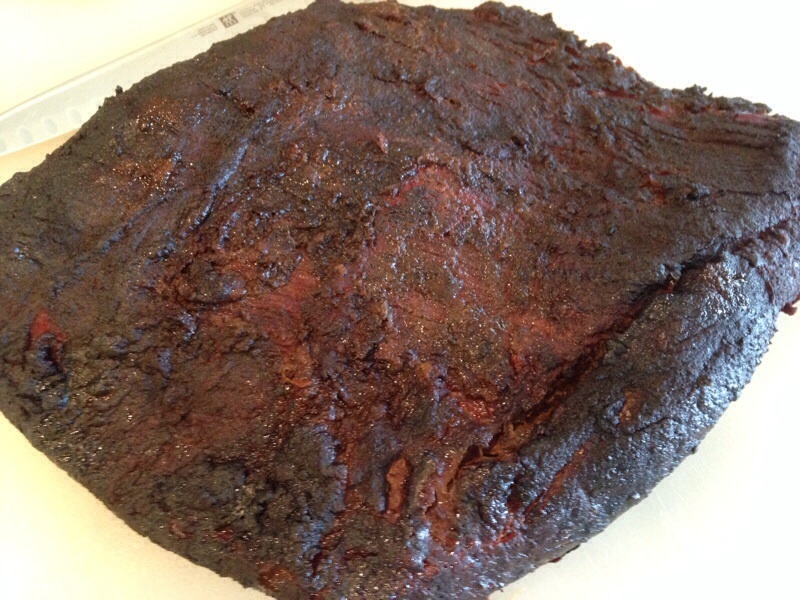 I put on a brisket last night at 7pm, took it off at 10am to separate the point and make burnt ends. 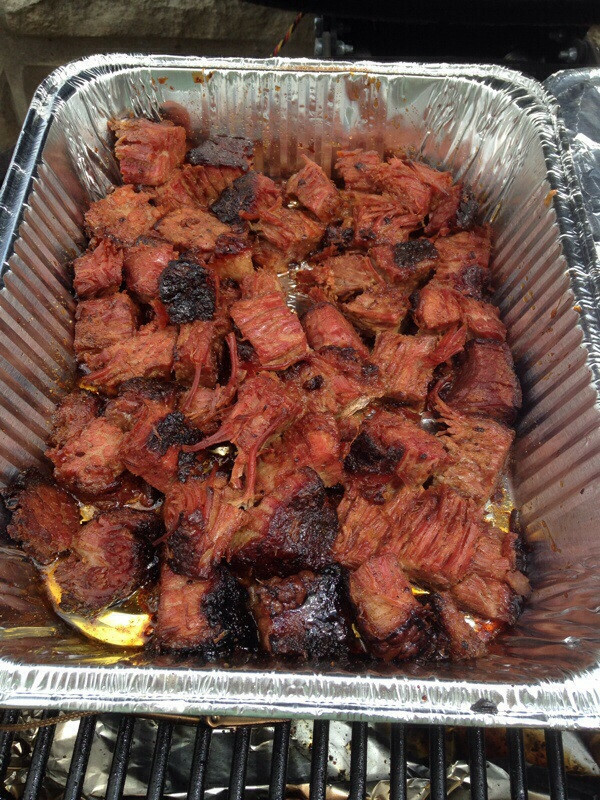 1130 am the flat finishes, burnt ends are done for appetizers and the slices are juicy and tender. 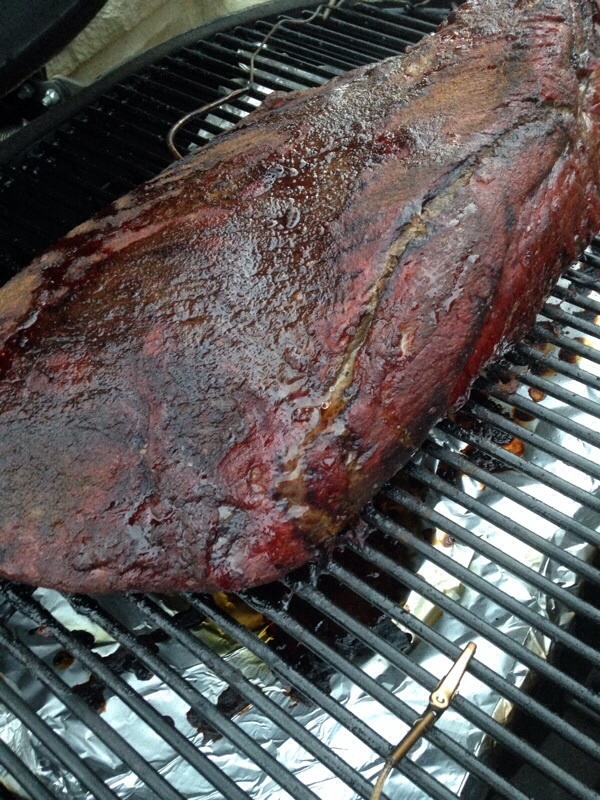 Best brisket I have cooked in a good while. Never seen meet cooked like that. It looks delicious ! Mike, YUMMM! 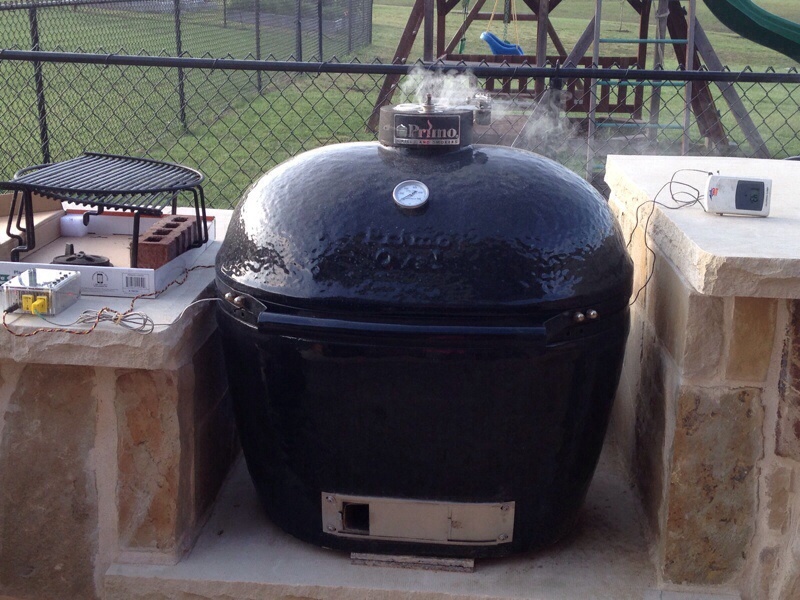 Good lookin' southern (USA) BBQ! For Fathers Day no less! Good eatin' there. I'd definitely take a plate! But locally I can't find brisket for anything less than steak prices, so I haven't bought any in a very long time. I need to make some pulled pork. I have one out in the shop right now, but it's been earmarked for Kielbasa sausage. 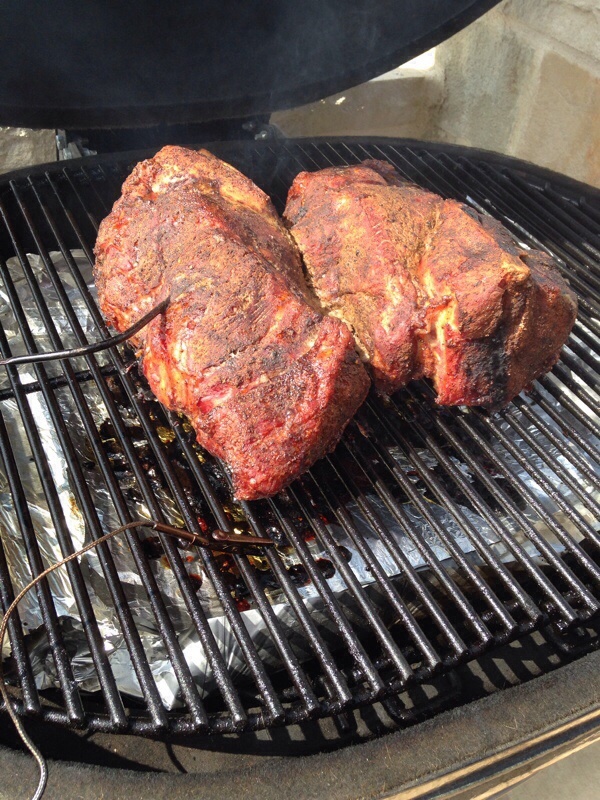 I need to keep my eyes open for chuck roasts and make some pulled beef too. Nuno Sa, it's an, as far as I know, purely American cooking technique, but it is growing legs and traveling around the world. It's still quite rare in your part of the world though. The closest Primo to you I know of is in Spain; I know of no ceramic cookers in Portugal. That doesn't mean they don't exist in Portugal though. Looks fantastic Mike ! 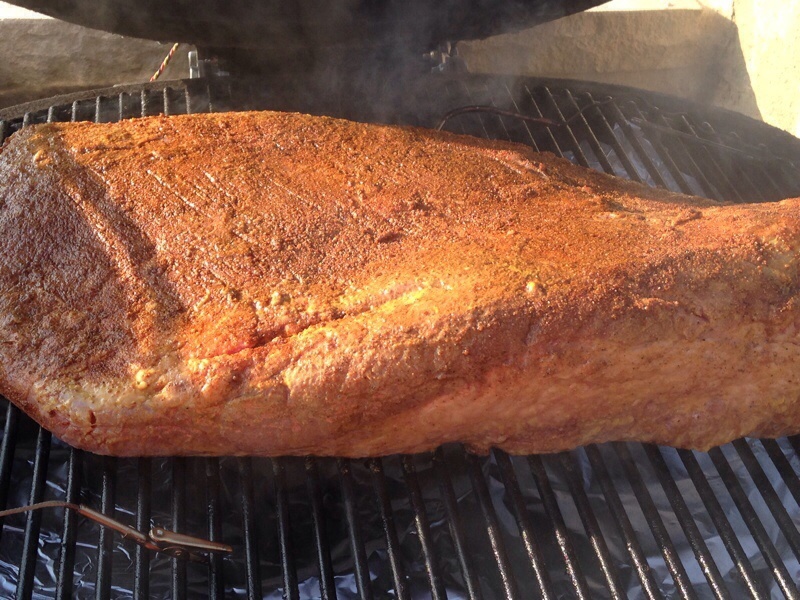 I do love a good smoked brisket . 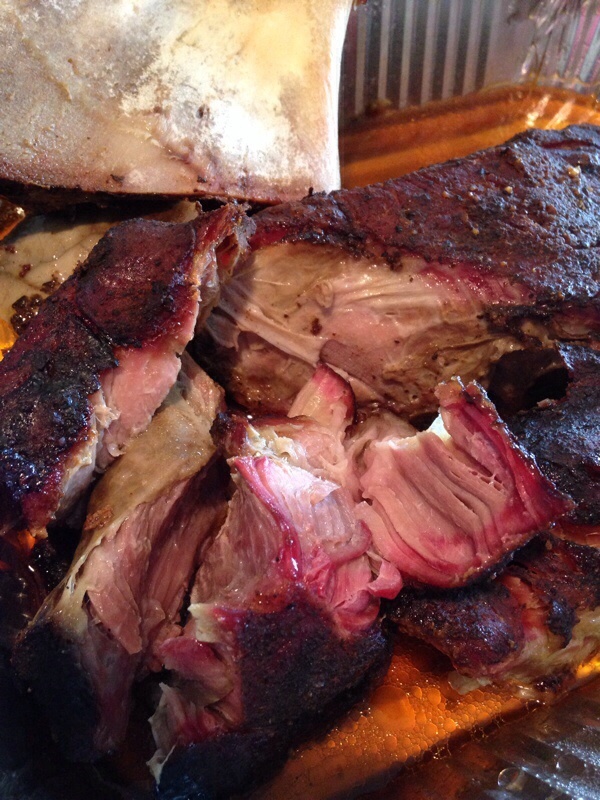 I smoked two slabs of ribs for dad today while he was out playing golf. He was surprised when he came home. Brian, my son in law picked it up from a butcher. Package was marked as superior angus beef and was not cheap! But it was worth it! 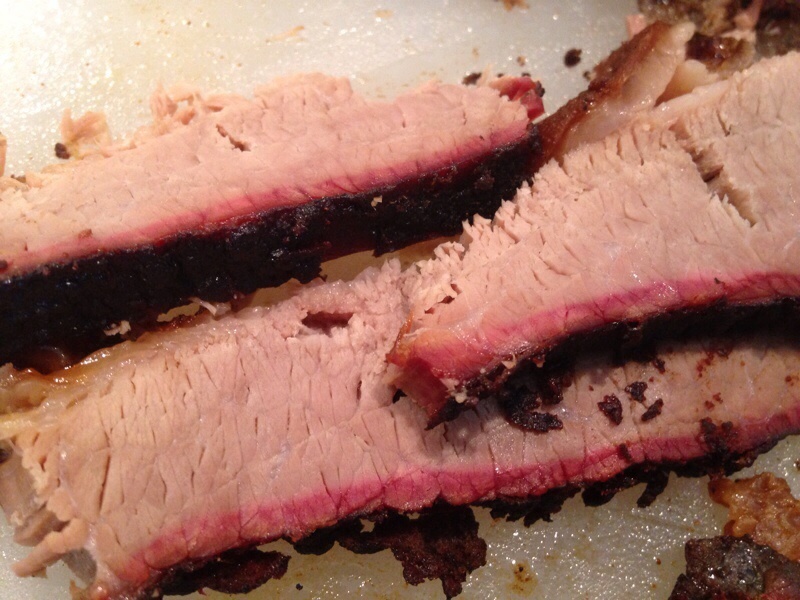 The best brisket I have ever cooked. Eric, ribs are my favorite. Your dad had to enjoy them! Ribs are my hands down favorite also, but beef short ribs. I won't turn my nose up if someone puts a slab of pork ribs on my plate though. But beef short ribs... I could OD on them. I'm kind of partial to ribs too. I usually do Baby backs. Simple meal tonight. We kept one package of the fresh made kielbasa out. We have some jalapeno beans mixed with a little bit of refried beans, we'll open some sauerkraut and have some brown bread with it. Right now I have the oven preheating the dutch oven for another loaf of the N0-Knead Crusty Artisan loaf. On second thought... no brown bread. We'll have that fresh loaf of crusty/chewey bread to go with the meal. We still, for the most part, cook as we did when we were working. On one or 2 days of the week we cook a mess of food and eat leftovers for the rest of the week. We do that 95% of the time. The difference now is that we are no longer forced to cook on the weekend. It just so happened that Saturday was one of the days this week where we cooked. Tonight I mixed 2# of ground beef with 1# of home made bulk (not in links) hot Italian pork sausage and made meatballs (pinade and some herbs added). They were browned in a pan, then simmered in marinara sauce to deglaze the pan and finish off the meatballs. A few meatballs and 2 slices of no knead crusty bread was used to sop up the sauce on my plate (no pasta), and a salad was supper. Now that they're cooked we can use them for pasta should we decide to cook some, or hot sandwiches (on a long roll). If we cook pasta we'll cook too much and somewhere down the road make Lo Mein out of the leftover noodles. I gave the neighbors a link of the homemade kielbasa the other day and they had it on Friday night. I warned Ann that it had whole peppercorns in it so there would be "crunchies" in it and that it wasn't bone. It's a real turn off to get a piece of bone or cartilage in sausage and inexcusable IMO. She was concerned about the "heat", but proclaimed the sausage really good and the spiciness to be an unfounded concern for both of them. So between the kielbasa that was cooked on Thursday night (?) and the meatballs they will allow us enough variations so that we won't get bored, yet not take up inordinate amounts of time every day for cooking. What can be done with leftover kielbasa? I thinly slice a few inches and fry the rounds, adding some scrambled eggs to it for breakfast. Since the sausage is so large in diameter, I take a length and slice it in half lengthwise to make an 1/2 moon sectioned "hot dog" to put on a long roll with sauerkraut and mustard. There are many other things that it can be turned into. But those 2 items are simple and easy to do. This time of year simple and easy are really good things. 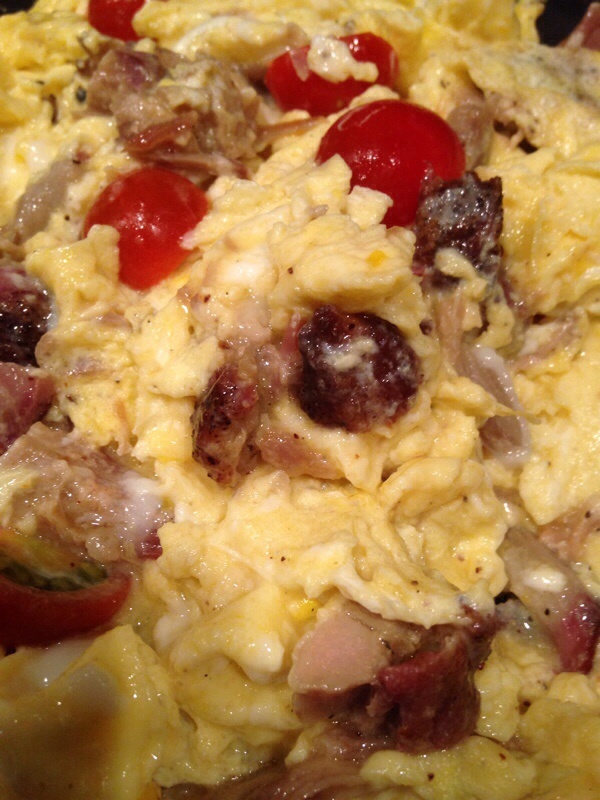 And breakfast...scrambled eggs with pulled pork and home grown cherry tomatoes. Home grown tomatoes; it must be nice... I just planted my tomatoes last week. That's late even for Maine, but I wait until all chances of frost are gone. Most people think that's Memorial Day up here, but some sections of Maine had light snow and frost 2 nights ago, and just last night some places went down to 31°F. I've lost too many plantings to late frost, hence my waiting. Once the seedlings are dead they're dead and that's it for the crop. Btw, I plan to make that easy bread you posted next weekend. Forgot the yeast today. Yeah, we only have one growing season. We either succeed with that one shot or we have nothing at least for things requiring seedlings. The ground was still too cold for planting corn until recently. But I'm playing around with lightweight moveable cloches to extend my season. OK, I had to design them to keep the Guinea fowl from eating my kale and onions (they love onions especially), and while I have tiny a-frame fences to keep them away from the seedlings until the plants are big enough to sustain damage, those same a-frames could be covered with plastic to give me a month or so earlier growing season. Voila! A cloche! One basic product, 2 uses. I like that. You really should try that bread. We just finished the last loaf I made, it doesn't last long around here. Tonight (about midnight) I'll mix up another batch. My mixer was feeling dejected by being bypassed for so long, so today I had to make up some homemade liquid laundry soap (not detergent - soap). Really. We've been using the same basic formula for quite some time now, but I just got another formula that's more concentrated and dissolves even easier in the machine. If I didn't know it was laundry product I'd swear it looked delicious; like cake icing. Of course it's completely inedible. But the mixer seemed happy for the few minutes it was used. I need to get BBQing. I've been playing around with SousVide for too long now. 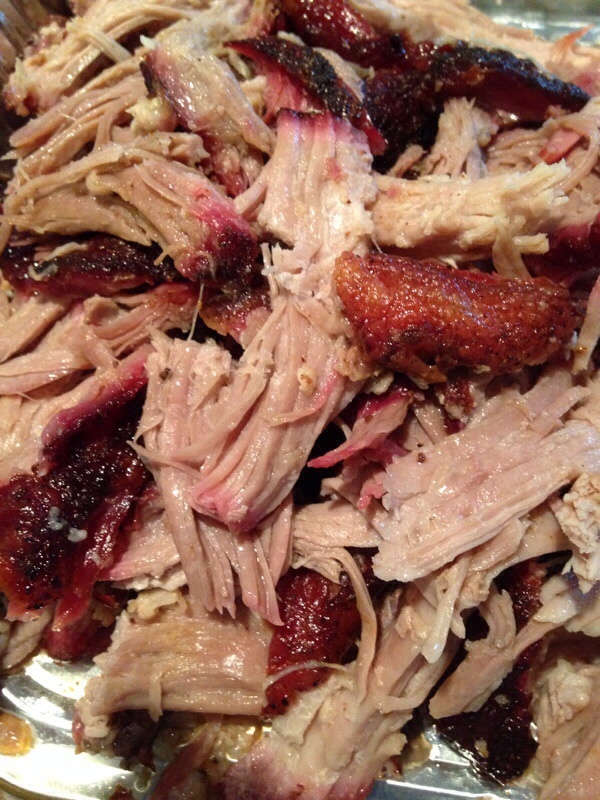 That pulled pork really looks good! Too, I have some corned beef in the freezer that really needs to be turned into pastrami. On that no-knead crusty artisan loaf it would be to kill for. Last night assembled the latest crusty no-knead artisan loaf. Baked it tonight to have with the simple supper of homemade kielbasa, jalapeno beans and the fresh bread. The loaf was possibly the best yet; the crumb, the delicate yet crispy crust, the chewy interior; just superb. I have it absolutely nailed down with commercially available flour, but before I post any update to the recipe I want to try to make it a few times with 100% home ground wheat. I want to nail that down as well one way or the other. I have made a few optional changes to the recipe to tweak it to make it better, but the differences are subtle. Worth doing? Maybe not. but they are minor and more involve ease of cleanup and handling the dough. The result is the better crumb and crust. Worth doing? Maybe not. YMMV. It's pretty easy as it is, without the changes and the results are great as is.